Blues laced R&B with a whole lotta soul--it's the Detroit grind and the barroom science that'll singe your wig. To those of you that support live music by regularly going into the blues trenches and smoke filled hell holes of America to see and hear cool bands laying it down, we say THANK YOU! Keep up the good work--you deserve a raise. When the bony, icy hand of the reaper is clutched around your throat as you lay on your death bed shaking like a leaf on a tree, peeing your pants, begging with all your heart for just one more brief moment of life, you will not be thinking about the times you spent in front of the television with the remote in one hand and a piece of pizza in the other. You will be thinking about the quality time you spent and long for once again hanging out with The Witch Doctors. Listen to Thayrone X and THE BONE CONDUCTION MUSIC SHOW on the radio every chance you get. See the radio stations carrying it on our website. This cd is what it's all about. 'Drunk Girl' tears it up! I bought this cd and the band's other cd. These guys play real American music. 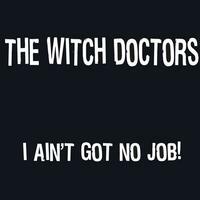 The Witch Doctors are what blues music is about. The songs are right out of a blues bar experience. The guitar work on these tunes screams. The Witch Doctors do great work! These tunes are on fire! This Cd rocks, top to bottom. High Temperature is IT!! You can drink beer to these tunes, all day long! Good CD. Worth the buy. Heard "I've Been Abused" on XM Radio. Had to have the CD. TERRY AND THE BAND HAVE COME INTO THEIR OWN. THIS IS A GREAT CD VERY COOL. TERRY AND THE BAND HAVE COME INTO THEIR OWN. THIS IS A GREAT CD. VERY COOL. IVE HAD THE OPPORTUNITY TO PLAY WITH TERRY A NUMBER OF TIMES OVER THE YEARS BUT HE NEVER HAS MADE HIS GUITAR HOWL LIKE THIS. THIS IS A GREAT BUY. you can smell a player from a mile away. this one takes the slack out of the boys!!. a great buy!!. yes, im shouting!!! This CD is awesome!! Can't stop listening to it!! !